If you are tired of using plastic water bottles, this white stainless steel watter bottle is for you! It will keep your water ice cold for hours on end! Even more, it will even keep your warm beverages nice and toasty almost just as long. This double wall water bottle is 26 oz, which is the perfect for your daily water. The tapered shape of the water bottle gives it a simple and very modern look while making it the perfect shape for carrying and storing. The stainless steel lid is easily screwed on and off and keeps your beverage vacuum sealed to keep it fresh. It even stays a steady temperature to the touch! These water bottles are personalized with a laser engraver for a clean, modern look. Use a quote or graphic from our system or upload your very own art work! 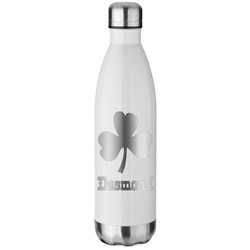 You can place your design on the front and back of the water bottle or keep it simple and just have your design engraved on the front. You can even have two DIFFERENT designs on the front and back! Hurry up and get designing! Be sure to look at the rest of our Drinkware as well! We have everything from coffee mugs, to mason jars, to beer steins. These work as amazing Gifts for friends and family!